Subject: Connect with University Housing for a chance to pick your room! 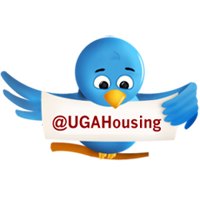 University Housing at the University of Georgia would like to invite you to get connected with us! Beginning today, Wednesday, April 11, 2012, and ending May 2, 2012, we will send out one special tweet and Facebook status update on Wednesday afternoons. Retweet our tweet to your followers or share our status update on your Facebook page to be entered for a chance to win your pick-of-a-room. A chance to win a guaranteed room for you and one roommate in our newest and LEED-certified residence hall, Building 1516, Myers Hall or Creswell Hall! Winners will be notified by May 11, 2012. 1. You must be a first-year student (freshmen) registered for housing. 2. You must be following us on Twitter or like us on Facebook for us to see your retweet and/or shared post. 3.Each retweet and/or shared post counts as one entry to the contest. Each incoming resident can enter the contest pool a total of eight times. Good luck! We can't wait to have you on our campus! If you are a private tweeter who follows us, we can tell that you have tweeted us, but we can’t see your tweet! That means we can’t add your name to the contest pool. Please consider making your Twitter profile public so that your tweets can be entered in our pool. Hover over the top right-hand corner of your post and a little grey box will appear with a drop-down arrow. 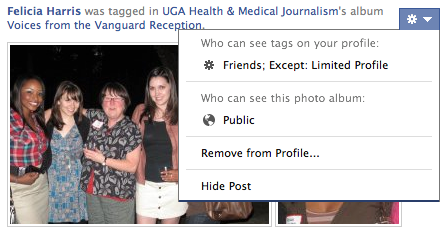 Click on the arrow to reveal your privacy settings. Check the icon for “Public” with a globe next to it. The box in the right-hand corner of your post controls your privacy settings. After completing those quick steps, your shared post should be public and we’ll be able to enter your name into our contest pool. When I try to make my facebook post public following these steps, the most it allows is Friends of Friends option. It will not let me make the post public. It might be because I am still 17? Is friends of friends sufficient? "If you are under the age of 18 then you will not have a public search listing. When you turn 18, please make sure to review your public search listing privacy settings." But don't worry, we'll discuss in the office and get back with you to make sure that you can be counted!